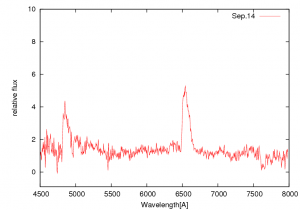 We performed optical low-dispersion spectroscopic observations of the possible nova in M31 ( PNV J00422171+4112338 ) on 2011 September 14.643UT using the 1.3m Araki telescope(+LOSA/F2). The total exposure time is 3600 sec. The figure shows our spectrum of the object. 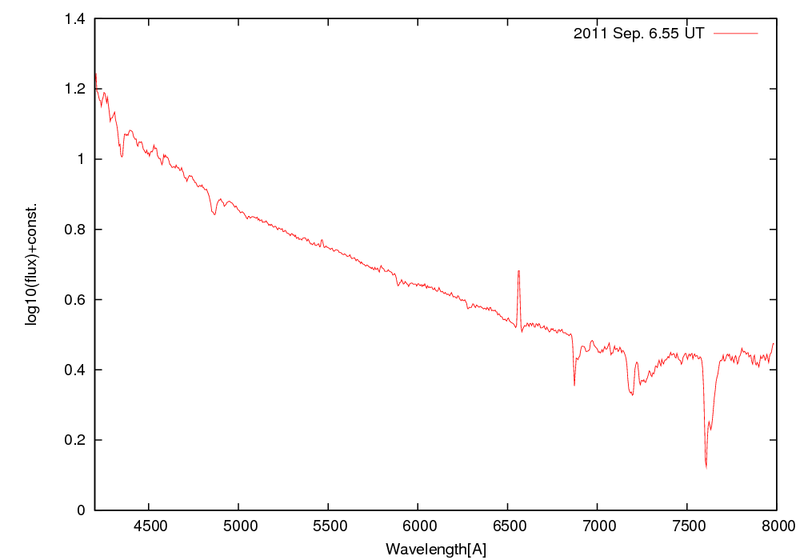 The spectrum exhibits quite broad H-alpha and H-beta emission features. No other significant features are identified in our spectrum. The FWHM of the H-alpha emission is about 4600 km/s ! This suggests that the object would be a very fast nova and a candidate of recurrent nova. Such high expansion velocities are often observed in U Sco-type recurrent novae. The photometric observations are needed. 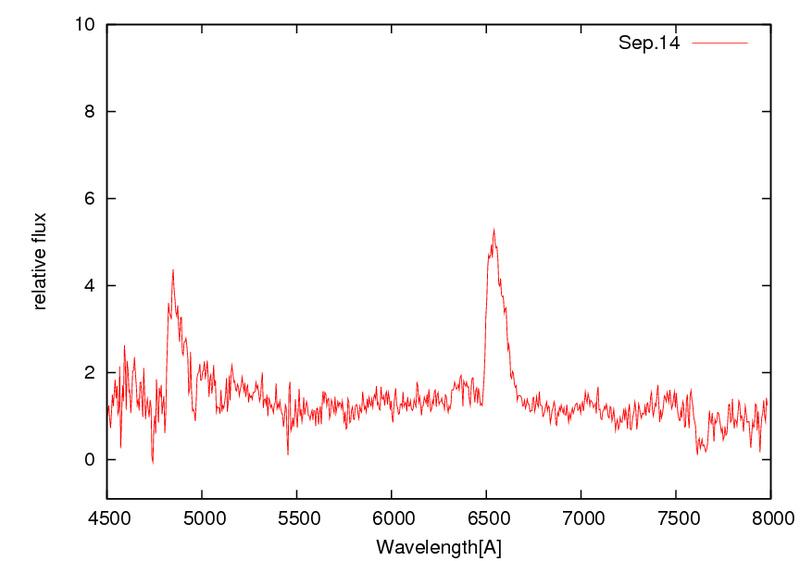 We performed low-resolution optical spectroscopic observations of PN in Sco (cbat name is PNV J16364440-4132340) on 2011 Sep. 7.42 using the 1.3m Araki telescope with LOSA/F2 at Koyama Astronomical Observatory. 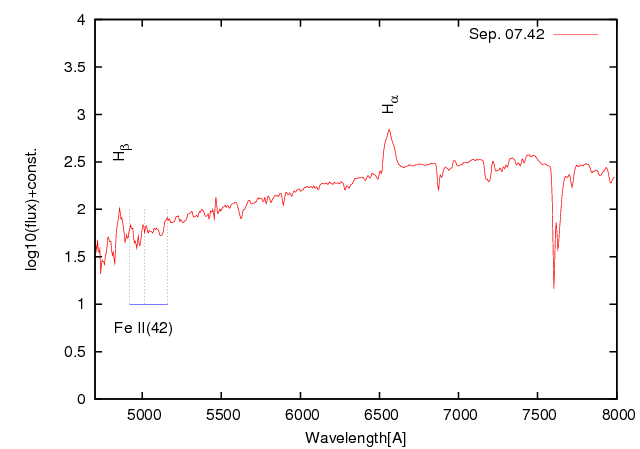 The spectrum exhibits broad Balmer emission lines and Fe II multiplet emissions on a highly reddened continuum emission. 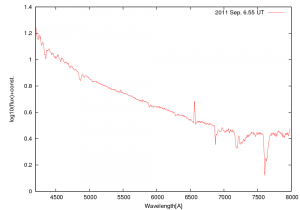 The H-alpha emission shows an assymmetric profile with FWZI about 6000 km/s. Other significant features are invisible in our spectrum. These results suggests that the object is an Fe II-type classical nova highly reddened by interstellar medium.